A Systematic Investment Plan (SIP) is a smart way of investing money in mutual funds. SIP allows you to make smaller periodic investments (usually on a monthly or quarterly basis) rather than a lump sum, one-time investment e.g. it (SIP) enables you to invest Rs. 1000, ten times over a period of time in the place of paying Rs. 10,000 at one single instance. But most of us get an increase in our salaries every year. Thus we can afford to increase the amount being invested in a mutual fund. But how is it possible in a SIP that is already going on? For this, you can choose top-up or step-up option while applying for SIP registration. It is important that your income and the quantum of investment should grow proportionally. Why should your investment grow when your income grows? If you invest, let’s say, Rs 5,000 every month for the next 20 years. Assuming a modest rate of return 12% per annum, you will end up making Rs 49.46 lakh on your total investment. But, if you slightly increase your SIP amount every year, once a year by 10%, then your entire corpus will approximately be Rs 98.45 lakh. That's a difference of Rs 48.99 lakh or 100%. Small additions can help you in a big way later. Some fund houses like ICICI Prudential Mutual Fund and Birla Mutual Funds provide you the facility of step-up SIP whereby you can increase your existing SIP amount. Most of the fund houses offer the facility to top-up SIPs, but it is still important to check with your financial adviser or distributor as to which fund houses offer same and which don't. There are two options to step-up your SIPs every year. The conventional approach is to simply decide how much more amount you'd like to invest every month and then start a fresh SIP. You can do that either in the existing plan (but the SIPs won't get clubbed) or in another scheme in the same folio. However, if you want to increase your monthly contribution in existing SIP, very few fund houses allow you to increase the money midway. On the other hand, most fund houses allow you to choose this option on SIP registration form before you pay your first installment. So, when you apply for a fresh SIP, you need to specify whether you want to increase the investment amount at a later date. Apart from some technical aspects, the reason why a change of SIP amount needs a separate procedure is because a SIP is a mandate that you give your bank to debit a certain amount from your savings account regularly. This mandate is applicable on that SIP transaction specifically, and cannot be revised. However, in compliance with new National Automated Clearing House (NACH) system initiated by the National Payments Corporation of India (NPCI), you can now issue one-time mandate that allows you to make fresh investments at a later date, in accordance with the amount and debit frequency that is registered. Every fund house has a common enrolment form and a SIP registration form. 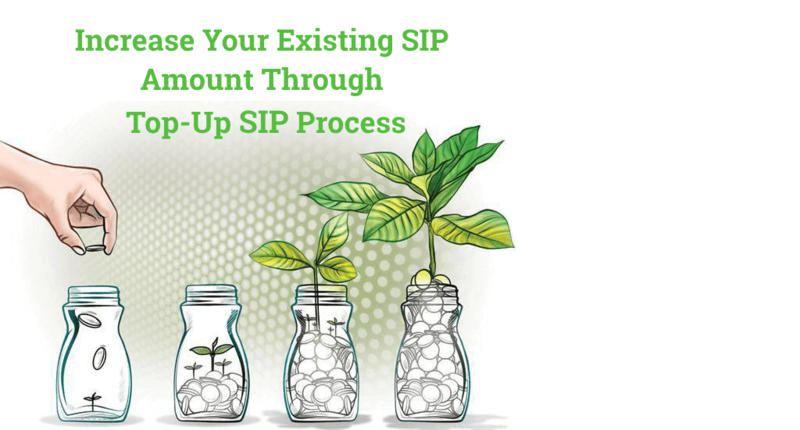 In the SIP registration form, after you fill your basic SIP details like the amount you want to invest on a regular basis, the date from when you want the amount to be debited from your bank account and the investment period; there are a few other options that offer the facility to top-up your SIPs in the future. Many fund houses allow you to increase the SIP amount every 6 months or once a year or both. Decide on the amount you want to increase your SIP by (normally Asset Management Companies i.e AMCs accept the amount in multiples of Rs. 500). You can also cap your amount if you think that you won’t be able to pay a monthly investment more than a certain amount. For instance, Rs. 1000 yearly top-up in Rs. 5000 would mean you would have to invest Rs 6000 every month from next year and Rs. 15,000 per month in the 10th year. Once your monthly installment approaches the cap, your top-up facility stops and then you can continue with the same amount for the rest of your SIP tenure.